The ecological success of Tamarix has proven disastrous for native species. 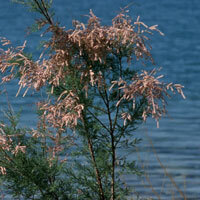 Tamarix forms dense, monotypic stands on riverbanks, crowding out other plant species. These stands support substantially fewer local animal species than do the indigenous plant communities they displace. Each Tamarix plant consumes up to 200 gallons of water a day, seriously depleting local water tables. Additionally, salty secretions from Tamarix salinize the soil and make it unsuitable for other plants. Tamarix recovers quickly from burning, cutting, and salting, and easily re-invades areas where it has been successfully eradicated. This problem space includes data from a published study of Tamarix in both the United States and its native range in Eurasia. These data include the geographic location (latitude and longitude) and nucleotide sequences for each individual plant sampled. ( Tamarix is diploid, so a single plant contains two copies, or haplotypes , of the genetic sequence: these may or may not be identical.) The nucleotide sequence data come from an intron of the PepC nuclear gene and are therefore assumed not to experience direct natural selection. The problem space also includes an unrooted phylogenetic tree of the haplotype sequences. Using only this phylogenetic information, a hierarchical nested struc ture has been determined for the tree. The resulting categories can be statistically analyzed in light of geographic data to determine the genus's population history. Is Tamarix genetically the same in the U.S. as in Eurasia? Which haplotypes were introduced to the U.S., and from what geographic region(s) did they come? How has Tamarix evolved in the U.S. since its introduction? Have individual lineages accumulated approximately equal number of mutations?in other words, does this region of non-coding DNA o bey a molecular clock? What factors might complicate this analysis? How much gene flow is there between local populations of Tamarix ? Can seeds from one patch of habitat reach nearby patches? Can they reach patches much further away? Is the current patter n the same as the historical pattern, or are there differences? Do U.S. and Eurasian populations show the same pattern?